The apes still rule the multiplex. The summer hit about genetic engineering gone wrong starring James Franco and Andy Serkis stayed strong in its second weekend at the box office, keeping its hold on the top spot with $27.5 million in ticket sales. 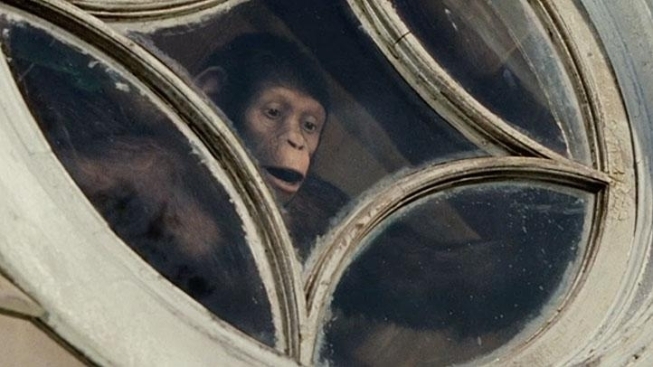 “Rise of the Planet of the Apes” has grossed $105 million domestically and $180 million overall. “It’s remarkable to only drop 50 percent and do $27.5 million worth of business, despite $60 million worth of new movies coming into the marketplace,” 20th Century Fox senior VP Chris Aronson said, according to The Hollywood Reporter. “Rise of the Planet of the Apes” maintained its edge with male audiences, hurting “Final Destination 5,” which opened in third with $18.4 million, and “30 Minutes or Less,” which bowed in fifth with $13 million. But the industry surprise of the weekend was the film that drew in women, “The Help,” which debuted at No. 2 with $25.5 million in box office receipts. The adaptation of the 2009 Kathryn Stockett bestseller about white women and their maids in 1962 Mississippi is probably benefiting from “exceptional word of mouth,” EW.com said, as CinemaScore audiences have rated the flick an A+. Its distributor, Disney, said 74 percent of the movie’s audience was female, and 60 percent was over age 35. Disney released the film (which was made by DreamWorks and Participant Media) early, on Wednesday, and it made $9.9 million on that day and Thursday—so its five-day total is $35.4 million. “The Smurfs” placed fourth in the U.S. this weekend with $13.5 million, but it was all green internationally, winning the overseas box office with $60 million in sales. “Glee: The 3D Concert Movie” failed to even crack the top 10 in its debut, coming in 11th with $5.7 million.